April | 2014 | Mehta Kya Kehta? Who listens to the bass in Black Metal? Since I’m always on about aesthetic perfection in everything, I’m going to write a paragraph about the importance of bass in Black Metal. 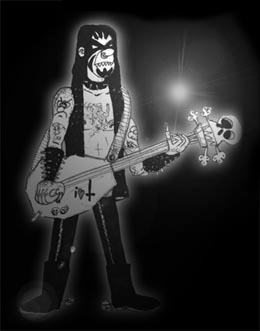 Bass is not only unnecessary but also unwanted in Black Metal. I don’t listen to Black Metal for the bass lines, and I dislike hearing the bass, unless it’s some genius like Varg Vikernes who knows exactly what to play, and even more importantly, what not to play, when not to play, how not… you get it. I attempted to emulate Varg’s bass-thetical perfection on The Darkness Of Being, but there’s something far greater about In The Name Of Satan: the bass can’t be heard. Because bass prevents you from enjoying true Black Metal. Bass is to Black Metal what Rob Trujillo is to Metallica; you wonder if it is aware it’s a complete misfit. The only role bass has in the frosty kingdom of Black Metal is to provide warmth to the fuzzy sound when the icy guitars need a rest. Bass sounds good if you can feel it and realize the band has a bassist, not if it’s muffling the rest of the band and keeping Black Metal from being raw. Unless the bass is evil and is making your Black Metal even more majestic because of how it sounds in the howling wind, this is what it needs to be: inaudible.